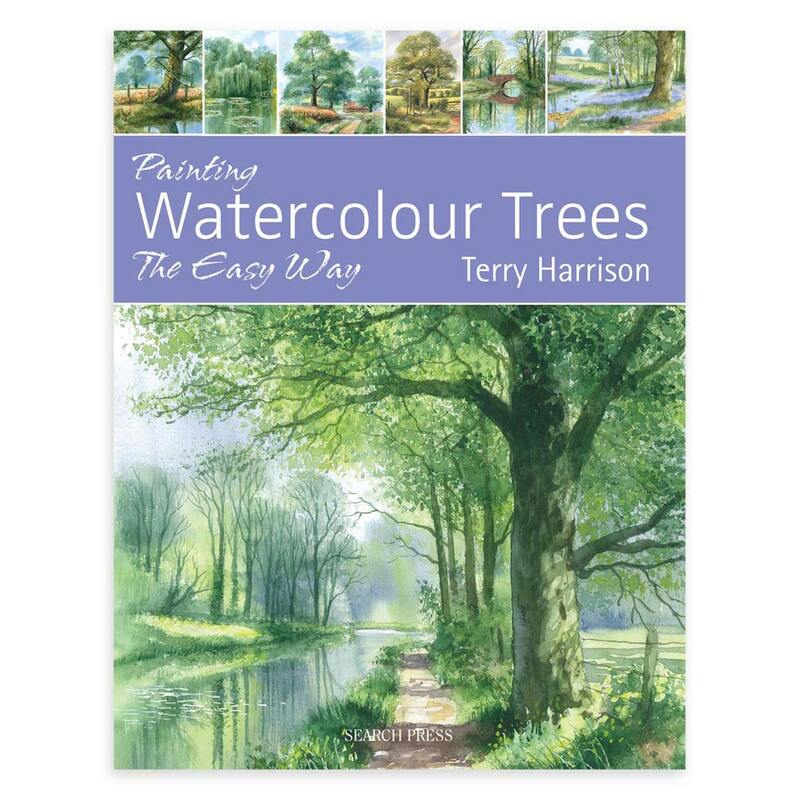 Following on from his successful book Watercolour Trees, Terry presents a new edition of this award-winning title, and includes a great selection of clear, detailed step-by-step demonstrations along with extra tips to show how to paint beautiful trees quickly and easily. He teaches how to paint an impression of trees, rather than showing how reproduce each leaf, and illustrates the importance of understanding shapes, perspective, light and shade, and the way foliage changes with the seasons. This is a book for all landscape artists whatever their skill levels, and anyone who wants to learn more about painting trees whether they are magnificent in their winter habitat, gloriously bedecked in spring foliage, splendid in their summer raiment or stunning when their leaves turn to russet reds and spun golds. Trees are an essential element for any watercolour artist to master, and Terry Harrison provides everything they need to know to paint them the easy way, from simple trees with a few strokes of the brush to fully developed paintings of trees in the landscape. Eleven beautiful step by step demonstrations and plenty of tips and techniques make painting trees in watercolour achievable. This book will give confidence to the beginner and will also inspire more experienced artists. Trees are popular subjects for painting and not many landscapes can do without them. Here is a guide on how to capture their elusive and special qualities with the medium of watercolors. I think Mr Harrison must be the only other person like myself, who does not stretch his paper, but presses it afterwards. Find out how in here along with all the usuals such as what paints to buy in order to paint trees and woods, working with photographs, kitting out your working area and composing a picture. Before you get to the paintings there are many techniques to practice, such as painting skies, leaves, trunks, using various brushes and other products etc. I like the way these are also in staged project form with all the photos and captions that make Search Press books so user-friendly. Next, you will move on with studies of trees through the seasons and different types of tree to practice what you have learnt. Finally, there is the largest section with plenty of paintings to tackle. These are again varied in their seasons, and include a bluebell wood (my favorite), waterside views, a winter scene, a mountain scene and an avenue of trees in autumn. As well as the step-by-step instructions, there are a couple of similar paintings discussed afterwards, which makes for a nice touch. You can actually learn the mysteries of painting trees in here, which makes it such a worthwhile purchase. Magnificent objects in their own right; trees help to provide perspective within a landscape. Getting them right can make all the difference to a painting. In this book Terry sets out to show just how trees can be painted and used effectively within a landscape. A variety of techniques are demonstrated such as painting trunks and foliage. There are some interesting hints too - use kitchen paper with masking fluid to dab on trees to give the impression of snow! He then goes on to show how some of the most popular trees can be painted such as an apple tree in blossom, horse chestnut, weeping willow, silver birch and an oak tree. The subject of setting trees within a landscape or season is also covered, with many practical ideas on how to use them and how to achieve the best effect. All in all, this is a very useful, practical book which justly deserves a place on any artist's bookshelf to be referred to time and time again. Trees are such an important part of the landscape that an ability to paint them successfully will help you progress with the subject faster. Not only are they essential to describe the atmosphere of a landscape, a well painted tree, whether it be a magnificent spreading oak or the bare branches of a tree set against a winter's sky, can add interest to a scene lacking in a focal point. Here Terry promises to show you how it's done 'with a few tricks and the right brushes'. A section on materials and equipment is swiftly followed by a description of the palette Terry uses, in particular his colour mixes for creating the perfect hue for sunlit green, country olive, autumn shades and burnt shadow for example colours you will be using time and again in your paintings of trees. This is followed by a useful chapter on using photographs, and combining photographs to make a better composition. Terry then moves on to techniques, including information on what brush to use for the effect you are after, how to use masking fluid, paint trunks and branches and, finally, foliage. The main body of the book is taken up with demonstrations, beginning with a section entitled 'Simple Trees', which describes how to create the impression of trees and helps to build up confidence before moving on to more complex subjects. Included here are trees in each of the seasons. How to paint specific tree species follows, including the cypress, pine, willow and oak tree, amongst others, plus an apple tree in full blossom. Trees in the landscape come next with information on how to place them convincingly in their setting. In total there are 24 step-by-step demonstrations, including an avenue of trees, a bluebell wood and trees in a winter landscape. Each of these demonstrations is carefully considered to help you build up your confidence and create striking watercolour landscapes. If you paint landscapes, sooner or later you're going to have to paint trees. Even if the worst predictions of pests and disease turn out to be right, bare, flat landscapes are unlikely to be a feature of the landscape any time soon. Books on trees are not exactly two a penny but, after a period when they were thin on the ground, several have come along in recent years, although they have tended to assume you want to paint trees as a subject rather than as a necessary adjunct to a wider view. Terry Harrison hits the nail right on the head with this guide. This isn't a book about how to paint trees, but how to paint trees in a landscape. It's full of the sort of good ideas that are Terry's stock-in-trade. Using his range of brushes (and if you don't want to buy them, you may find you already have suitable alternatives), he starts by showing you how to create realistic and believable shapes quickly and easily. If there's a wood on the horizon, this will take the mystery out of putting it there. Get further into the book, and you'll find advice on dealing with individual species, which becomes important if they're a foreground feature. You'll also find demonstrations showing trees in a variety of situations, including woodlands and landscapes, as well as mountain and river scenes. In fact, just about everything you could want. Even with all the dire predictions of bugs and disease, the totally bare landscape is unlikely to be with us any time soon. Trees, by their size and presence, are one of the defining features of any scene and getting them wrong can mar a painting as surely as badly painted features can turn a portrait into a caricature. Terry is a slick presenter and he starts the book with ways of creating simple shapes that look immediately convincing. His own range of brushes comes into it, of course, but in an understated way, and you have to admit that theyre rather useful. And anyway, you may already have the basic shapes in your kit, so theres no hard sell here. The obvious next stage is trees through the seasons and Terry provides quick demonstrations that show a variety of compositions, such as an ivy-clad trunk beside a winter lane, that give you a chance to get your bearings. Moving on (the title of the next chapter), you get specific varieties. Even here, the emphasis isnt on the details but rather the shapes and colours and how to present them as adjuncts to the main composition. This section is something of a tour de force as Terry underplays his hand masterfully, using the subject of the book as a foil to the main work. After all this, you might be surprised to find the final section of the book being called Trees in The Landscape. Although that seems to be what weve seen already, here Terry paints some really quite ambitious scenes where the trees really are the main feature, yet are still not portraits. He works in a variety of conditions and demonstrates clear light, dappled shade and misty recession throughout the year. Theres a lot here and its genuinely surprising just how much Terry manages to wring out of his subject without any sense that hes stretching either it or himself to fill the 128 pages. If you really struggle with watercolour but are still persevering against all odds, try this book. There are 24 step-by-step demonstrations showing not only trees but landscapes as well. You'll be able to choose scenes from all seasons. There is a complete guide to painting trees in all seasons, then incorporating them into the landscape. Terry guides you through the process showing his palette, brushes and techniques. This book used material previously published as Terry Harrison's Watercolour Trees.